Happy Thanksgiving Sugar Fix Fans! For a lot of us Thanksgiving is a day spent with family, watching football, and eating way too much delicious food. For my family it starts the night before, prepping and drying a loaf of bread for my grandma’s homemade stuffing. Then first thing in the morning it starts again with baking a Dutch Apple Pie and preparing the rest of the day’s delectable goodies. The best part, is the memories we make while visiting, laughing, and cooking together. 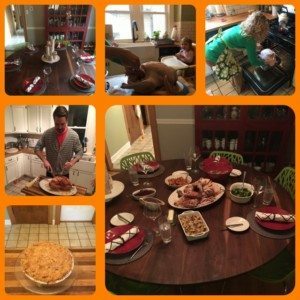 But after all the turkey has been eaten and only a slice of pie remains, have you ever wondered what Thanksgiving really is all about? The history of Thanksgiving dates back to the fall of 1621 when the pilgrims had their first successful corn harvest and called a feast celebration, inviting a group of allied Native Americans. This maiden feast lasted for three consecutive days. Although there is no record of what the actually ate, they likely ate deer and did not have any of the delectable sweets we enjoy today. Years later in 1789 George Washington proclaimed Thanksgiving as day of recognition marking the end of the war for the country’s independence. It was however not made a national holidays until 1863 when Abraham Lincoln made it the final Thursday in November. It remained that way until during the Great Depression in 1939 when Franklin D Roosevelt moved it up a week. In 1941 a bill was signed making Thanksgiving the fourth Thursday of November as it remains today. Turkey has become the centerpiece of Thanksgiving tables despite the thought that it was not apart of the pilgrims first Thanksgiving meal. History tells us that it became an integral part of celebratory meals for several reasons. There needed be a large enough amount of food to feed a large group and in the 17 and 1800’s cows were more valuable alive then dead, rooster was too tough, and hens needed to be alive to lay eggs. The other benefit of turkeys are they are born in spring and had enough time to fatten up to ten pounds or more to feed a large group. Today more than 90 percent of households eat turkey on Thanksgiving, but the sides may vary from region to region and family to family. Whatever your Thanksgiving traditions may be, take the day to be grateful for all you have and hopeful for our futures.